At Queenswood United Church we serve God by taking care of God’s creation. We help those in need, we nurture the young, and we support our immediate community and the world community. We are conscientious stewards of God’s planet. Our service is centered in a commitment to living Christ’s love for all. It is nourished within an informal but meaningful worship life and a relationship with each other that is open, inquiring and accepting. We are a member congregation of the United Church of Canada. We are grounded in Christian tradition and are open to the truths of other faiths. We are a small, energetic and friendly community of faith who find joy, support and strength in worshipping and working together. Our church family is precious to us. We strive to be faithful servants of God in our time and place. We welcome all who quest sincerely to join us in our faith journey. We are an engaged community of faith, finding Christian Fellowship in our activities together. We are open, accepting, respectful and sincere. We are seekers, striving to understand God’s Will for us. We are nurturers of God’s creation. We believe that we are not alone, that we live in God’s world. We believe that God bears unconditional love, mercy and compassion for all in all of creation. We believe that we are called by God to act in love. We believe that we are the hands and feet of God to serve others. We believe that the challenge of growing our faith is a life-long journey, and that we are greatly enriched by sharing that journey within community. We take care of each other, in prayer and in practice. At worship we pray, sing, laugh, celebrate and reflect on the Word of God. We have a strong ministry of music. We provide a safe place to practice and explore. We focus on living Christ’s teachings through our actions. We continue our strong tradition of outreach to the greater community. We accept that we are blessed to be able to share our gifts with one another and with all creation. We celebrate the gift of God’s grace. The past year has been a time of building relationships and settling in together. It is good to have a sense of continuity for our church family. Worship is always a highlight for Queenswood United Church. We had a variety of ways in which we offered our praise and heard God’s Holy and sacred Word. We had drama, sermons, poetry, our favourite hymns and special services. Orleans United dropped their Sunrise Service and requested that their members attend Queenswood’s. In October 2018, we had a special worship service in honour of our 35th anniversary, with Linnea Good and David Jonsson providing inspiring music. Linnea is a well know Christian singer/songwriter, and we were blessed by her leadership. We also hosted the Pam Hodges Trio for an evening of spiritual songs, poetry and music. Our music Ministry is exceptional; many thanks to Pianist Lynne Stacy, Choir Director Michelle Godin, members of our choir, and other musicians who shared their gifts. My holidays were capably covered by our skilled Worship Committee or Licensed Lay Worship Leaders. We provided monthly worship services to our neighbours at The Queenswood Villa. Thanks to those who came along to help with music and shared fellowship with the seniors. The seniors deeply appreciate our companionship and time together. Last February, I dropped Thursday morning’s office hours. I felt the need to have more time for pastoral care visits as opposed to office/administrative time. It also provided extra time for me to catch up with tasks such as worship plans and reading for Presbytery Meetings. Regular pastoral care visits have been made to people in hospital and those unable to get out regularly for services. These are appreciated. I also keep contact by calls, emails, CNN and Facebook. Social media is a valuable tool in maintaining relationships. Fundraising is a cornerstone of our activities at Queenswood. We have participated in our Snowflake Bazaar, Victorian Tea, Navan Fair, Spring Fling, MacMillan’s frozen foods, and other ways. We were happy to welcome Morgan Hamilton-Kirk to share a project for school with us on February 18, 2018. Morgan gave out Canada 150 tulip bulbs for a donation to ChariTree Foundation. The ChariTree Foundation is Canada’s national environmental education charity for children. The Montreal and Ottawa Conference AGM business meeting was held on May 11, 2018 through teleconferencing, and this went much better than last year. It included Nominations Report, Nominations List, Settlement Report, M&O Audited Financial Statements, additional pictures and bios of nominees and retirees. It was exciting to vote for the Candidates for Ordination, all passed. The Conference Meeting was in Wyman, QC, on Saturday, May 26, 2018. Reg Best and I represented Queenswood United. Barb Bode, our Office Administrator worked from Prince Edward Island for four months in the summer. The office functioned well with the many hours contributed by Barb Johns and Elayne Bonnell. Thank you. Tom Sear capably covered our music for most of the summer. Queenswood United Church has a leadership role in the greater Orleans Pastoral Care group. This group is made up of members of local churches of several denominations, including United, Anglican, Catholic, Lutheran and Pentecostal. We look for ways we can support the community, especially seniors and the vulnerable. We have been participants in hosting turkey dinners at the Montfort Renaissance Residence for recovering addicts. We also contribute to The Well, Centre 507, The Mission and Kiva. We have a project under consideration involving regular communication with housebound, lonely seniors. During the summer, for study leave, I was able to participate in an online preaching course. I enjoyed the interaction with fellow clergy and the Professor, Rev. Lisa Cressman. The course promoted the use of Lectio Divina, as well as a sermon writing grid to assist in timely sermon writing. I do not have a problem writing my sermons but benefitted from this new style of planning and reflecting. This online collective is something I would like to continue. On November 18, 2018 our church took a positive move ahead by voting to change our zoning to residential. This will allow for development of some of our property. The United Church of Canada saw major changes in its structures being passed. The biggest change is going from Presbyteries to Regions. The final meeting of the Ottawa Presbytery was December 11, 2018 at Rideau Park United Church. I was honoured to be asked to participate in the closing worship service. In summary, Queenswood United Church had a year of wonderful worship, and faithful service to God. Our fundraising and outreach to our community reflect our solid Christian values of reaching out to our neighbours and helping others. Our Council and Committees volunteer their time and talents for the betterment of our church. As we look ahead to a future together as Queenswood United Church family, may we do so with dreams and visions of what God is calling us to do and be. Reverend Nancy Best ECE, M/DIV. 2018 was different from past years in that the realization was made that we could no longer continue as a church in its present form for very much longer. The congregation made the decision to move forward with the development of the church property. There were also a number of other highlights throughout the year. Holly Bertrand did an exceptional job in May by re-branding the Spring Fling into the Spring Market and arranging for a number of local artisans to display and sell their wares. The resultant event was an outstanding success. Arrangements were made to permit the Office Administrator, Barb Bode, to work from her cottage in Prince Edward Island for a four-month period, June to September. This arrangement seemed to work quite well for both QUC and Barb. Unfortunately for our church, during this time, an opportunity for an early retirement arose there for the Bodes. The congregation said goodbye to Barb in October and to Greg in December. They were both active in the church and on Council and will be missed. On the positive side, the church welcomed Denise Benoit as Barb’s very capable replacement. The Navan Fair was a moderate success. Elayne Bonnell and many of our church members worked very hard. However, a combination of hot weather and a curling club manager who was unfamiliar with Fair Board policies reduced the potential return. Archie Newby and his beer can crew realized the usual return deposit revenue. On November 18, the congregation met to make the very important decision to remain the same and gradually disappear or to approve the rezoning of the church property to permit future development. A number of development options were discussed with the realization that there is still much work to be accomplished before our future is determined. Happily, the congregation unanimously agreed to allow the rezoning. I wish to commend all of the committees for their stewardship. Through your diligence we should be able to achieve a nearly balanced budget for 2018. The Outreach Committee’s various appeals throughout the year, including toiletries, Thanksgiving and the Mission Tree, were, as usual, generously received. Pastoral Care continued its good work administering to people’s needs both within and outside of the church. Queenswood United is blessed with a Minister and Worship Committee that are dedicated to providing us, each week, with quality worship services and an exceptional music program. Archie Newby takes his role as Chair of the Property Committee very seriously and uses his handyman skills to keep our church in good repair. The Craft Group deserves recognition for its contribution to our church with the annual Snowflake Bazaar. A small group of dedicated and talented women work hard throughout the year to make this bazaar a success. Without fanfare, the Men’s Club periodically provides funds to the church to cover unexpected expenses. The church is grateful for this quiet assistance. The financial input from our two corporate supporters, Boston Pizza and Home Hardware, is acknowledged with gratitude. Queenswood United is at the cusp of a bright new future. It will be realized through the careful consideration of all of the options, making possibly difficult decisions, and hard work by us all, through 2019 and beyond. It has been my privilege and honour to have served as your Chair of Council for the past two years. I enjoyed my time as part of a group of enthusiastic and energetic Councillors and leave with the knowledge that it is being left under the capable leadership of Stan Blythe. They will share the costs of the wifi plan. The Pedalheads Summer Camp went very well this year and it was a pleasure to have the children and staff present at the church. Their rental fee was a welcome addition to the church’s income. The Minister’s printer, an older monochrome all-in-one laser, became troublesome. That printer was recycled and the Minister now prints wirelessly to the main printer in the Administrator’s office. The Administrator’s printer, a colour all-in-one inkjet, is performing adequately, but the operating costs (per page) are relatively high and the print quality is not very good. We began using an older monochrome laser printer for higher volume jobs like the bulletin. If it becomes necessary to replace the main printer, we are considering a monochrome all-in-one laser for better print quality and lower operating costs. In June, the Administrator’s laptop failed. Diagnostics were performed by a local shop in Prince Edward Island (PEI) and it appeared that the motherboard had failed, with a repair cost of approximately $500. Inquiries with the vendor, Staples, advised that it was out of warranty by about 4 months, and confirmed that it was very likely the motherboard. It was decided that the laptop was not worth repairing. Barb Bode continued to telecommute from PEI to work using her own laptop. With the money budgeted for a printer and an additional amount approved by the Finance Committee, a new, good quality desktop computer was purchased for the office. A church member generously purchased a 3-year extended warranty for the computer as a gift-in-kind. In order to maintain an inventory of church keys, the Office Administrator completed a spreadsheet showing who currently holds keys to the church. It appears that every individual who has a key needs that key. We’ll keep it up-to-date as responsibilities change. In June, the litter problem in the parking lot became quite bad and included materials that appeared to be related to the sale of marijuana. This was of particular concern because the summer camp was about to start up using the parking lot. The Ottawa Police Service was requested to include our parking lot in their regular evening patrols and was granted Agent Status on the church property for the purpose of preventing and investigating offences on the property. In other words, even though it is private property, the police can act as agents of the property owner in questioning people who are present. The litter problem has improved. We catered fewer events this year, both by choice and circumstance. There were four requests we could not accommodate due to booking conflict or a lack of volunteer availability. We continue to support the congregational events like the men’s pancake supper, Lunch and Bridge, Victorian Tea, Linger Lunch, and of course, hospitality/memorial receptions. We continue to provide excellent service and product with our loyal, generous volunteers. I believe that unless 10 more energetic volunteers (who can also cook) suddenly appear, we will continue to restrict our contributions to familiar events, primarily responding to the needs of our own congregation. We will also undertake a review of our pricing, menu and standardize what we can offer QUC and/or the community. Thank you for all you do so well. We are approaching the 12th year of providing food services during the Navan Fair. Our list of services and menu has grown as so have our patrons â€“ until 2018. We were faced with many last minute venue failures and weather issues and served only half as many at our Café as previous years while working under very unpleasant conditions related to air-conditioning failure. We have approached the Fair Board regarding specific issues to be addressed before we can return. In a fall request for more volunteer support, several people have indicated their willingness to join the team or make a greater commitment of time for planning, setup, serving on site, etc. The committee will meet soon to review menu, site requirements and volunteer recruitment. Usually, we have about 50 people involved in this venture including Archie’s can collection team. It has been a remarkable commitment with opportunity for training the young, presence in the greater community, fundraising and tremendous fellowship. We hope we can continue but that it is not a burden but rather an efficient, profitable community service. There aren’t enough words, space or hours to express the gratitude that we have for all the contributions of time, money, food, service, generosity of mind, body and soul. Whatever the future, thank you for all you have already given. We had another successful growing season this year. There are six garden plots that are approximately 3m by 4m. One was used by a church member, one by a community member and four by Lynda & Bob Rodney. These four plots were able to provide 12 very large boxes of a variety of vegetables to the Food Cupboard in Orleans. They were very thankful for the fresh produce. The goal is still to have six plots this spring and used by church members or members of the community. The annual Snowflake Bazaar is the primary focus for the QUC Craft Group. A small group of women who love to craft, meets Monday mornings at the Church from 9 to 11:30 am to make articles for the Bazaar. We have lots of fun, conversation and coffee as we work on items for the Bazaar. The financial results of the November 10, 2018 Snowflake Bazaar follow this report. All monies raised by the Craft Tables, Bake Table and Tea Room go directly to the church’s operating funds. But the Bazaar isn’t just the Craft Group. So many people help to make this fundraising event a true congregational effort: from the delicious contributions from QUC’s creative cooks to those folk who came to shop and stayed for lunch and those who did special crafts for the Bazaar tables. A few folks deserve a special thank you. The Pastoral Care Group provided coffee and muffins in the early morning. The Tea Room expanded from 7 to 10 tables this year. Lynda Rodney and her helpful elves did a great job of providing weary shoppers and workers with a delicious lunch. Marilyn and Albert Joseph managed the Bake Table with their usual enthusiasm. Thanks to everyone who baked or preserved to fill the tables to overflowing. Also, thanks to the phoning committee who contacted everyone in the congregation. Others who helped. The Choir cleared out the Chapel after practice on Thursday night and set up the tables (no piano moving needed this year!). The Men’s Club helps out is so many ways – set up tables for the Bake Sale, arrange and supervise their Book Sale, assist with the clean up after the Bazaar and help get the Chapel ready for Sunday Service. Don’t forget to save any recent paperbacks for next year. Thanks to Pat Lackie for putting notices in the print media and to Denise Benoit for making sure our announcements were in CNN. A special thank you to Rev. Nancy for agreeing to volunteer as our welcoming greeter. The Craft Group was sorry to see Barb Bode leave for greener (saltier) pastures in Prince Edward Island in October. We thank her for her enthusiastic help and ideas. The Group experimented with a smaller space this year. We found that we were much better organized and we were able to serve our customers more efficiently. Thanks for all your support! As always, we are looking for new ideas and welcome any suggestions. We also welcome completed hand-made crafts or even lessons on a new idea. Please speak to any member of the Group – Donna Booth, Helen Keeney, Marie Latter, Bev Morwick, Vi Newby, Arlene Widdows or Ellie Young – or come on a Monday morning and join in the fun. We hope to see you at the Snowflake Bazaar on November 9, 2019. Circle it on your calendar! The purpose of the Finance/Stewardship Committee is “… to manage the financial affairs of the church in the best interests of the congregation and in keeping with the over-all objectives of the church”. Its primary role is one of oversight, to make sure the framework is in place for church finances to take place in accordance with good governance practices and in compliance with relevant legislation. Current membership consists of a Chair (Marilyn Joseph), Church Treasurer (Julia Picotte) and Stewardship lead (Rose Marie MacLennan). Among the Committee’s responsibilities are: implementing an annual independent review of the church’s finances; ensuring that funds received are disbursed as set out in the approved annual budget; and, dealing with various financial situations as they arise during the course of a busy congregation’s many activities. Following end-of-year submissions from committee Chairs and other church leaders, we met in early January to formulate a draft budget for Council’s input. Council in turn examined and debated the document, and finally recommended a deficit budget for adoption by the congregation at our Annual General Meeting (AGM) in February. During 2018, congregation members worked diligently to curtail expenses, so that, as of mid-December, we are very close to breaking even. Composing a “Narrative Budget” to tell our story was an objective of the Committee during 2018, but we have not yet achieved this aim. Following Rose Marie’s presentation of givings categories at the AGM in early March, two givers increased their Pre-Authorized Remittances (PAR) amounts. Sunday givings are down this year, and with a decline in the intensity of our fundraising activities, we are seeking ways to bolster our financial situation. The Office Administrator worked remotely from her summer home from early June until early October, while volunteers Elayne Bonnell and Barb Johns worked two days a week in the office. Finance’s main concern was that all of the financial transactions necessary to the smooth functioning of QUC be carried out in a safe and timely manner. Thanks to the work of Elayne and Barb, plus others who volunteered to make deposits, sign cheques, pick up and secure the Sunday givings, and help with the weekly count, everything went remarkably well. notably in the areas of transparency and security. We are beginning to gradually build a Financial Management Procedures Manual, as procedures from all individuals involved in finances at QUC are collected. Another area of achievement this year was the revision of the Committee’s two-decades-old job description, in order to better reflect actual practice at QUC. The Envelope Secretary is no longer a volunteer position within the Finance/Stewardship Committee as its tasks are now absorbed into the Office Administrator job description. The position of Fundraising Coordinator is not filled at this time, although the Committee liaises regularly with QUC’s fundraising leaders. The responsibility for dealing with unbudgeted and over-budget requests for congregational needs was added to the job description: requests in excess of a specified amount must obtain Council approval. the Annual Charity Tax Return on our behalf. In 2018, she supplied financial information to our EDGE consultant for his preparation of a 10-year forecast for QUC. Her specialized knowledge is invaluable to us, and her patience in the face of multitudinous demands is much appreciated! The previous Chair of Marketing and Communication, Barbara Bode, moved to PEI in October, 2018, and a new Chairperson has yet to be identified. If you have an interest in taking on this responsibility please contact the Chair of Council. We are happy to announce that Marta Nuijten will coordinate the content of the church’s website in liaison with Ron Newby, our webmaster. The website is an excellent tool to share information about our Church. It has become even more important with the closure of the local community newspapers in 2018. The weekly “Our Town” community advertisements in the Ottawa Citizen is used for advertising our fundraising activities along with various online websites. Members of the congregation are encouraged to bring forward their ideas for marketing our Church within the Orleans/Ottawa community. The Memorial Committee has had some work this past year. We started out the year with $5,365.58. We received many donations to the Memorial Fund and also paid to have the More Voices booklets made into hard covers. We ended the year with a balance of $5,513.90 in our Bank account. Anyone wishing to donate to the Memorial Fund may do so by contacting Lynne Stacey at home or at the church. 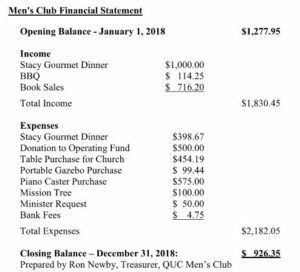 The Men’s Club continued, throughout 2018, to fulfil its mandate to financially support the church by providing funds to help with unbudgeted expenses and to perform maintenance and minor construction tasks, as required. We support the various charities identified by the Outreach Committee such as the Mission Tree. For example, we bought six new tables and paid for the new castors for the piano. We also provided $100 in grocery cards for needy families. When Archie Newby and Greg Bode were elected co-Chairs of Property, the Men’s Club became the members of that committee. All of these activities are carried out through fellowship and fun. Money to finance these projects is collected through fundraising. We sell books, jigsaw puzzles, and DVDs at both the Spring Market in May and the Snowflake Bazaar in November. On behalf of the church, with the revenues going directly back to the church, the Men’s Club sells MacMillan’s products in April and December as well as organizes the annual mushroom compost sale. In the absence of the Time and Talent Auction, we now directly put on our gourmet supper for eight. On April 21, the Men’s Club had the honour of catering to the 25th Anniversary celebration of Susan and André Clement. We were sorry to bid farewell to one of our eight members when Greg Bode decided to join Barb in Prince Edward Island in December. Greg was an active member of our group and both he and his largescreen,3D, TV will be greatly missed. As usual, we are happy to welcome any man, who is a member of the congregation or who is connected with it, to join us. The Men’s Club meets monthly, from September to June, in members homes and includes a business session followed by fellowship. We enjoyed a BBQ supper meeting at Steve William’s home on June 19. The Men’s Club also sponsors the ever-popular monthly Saturday morning breakfast at Gabriel’s Restaurant, averaging 8-12 participants. We are also on hand to flip pancakes at the Shrove Tuesday supper. Several elderly gentlemen residing in the Queenswood Villa have expressed an interest in some male fellowship. The Men’s Club was approached to see if we were willing to participate in some joint activities. As an inaugural event, we met for lunch at the Villa on November 24. Future activities are being considered. I wish to thank the members of the Menâ€™s Club for their support throughout the year and for their willingness to come forward when needed. Our group is small but very dedicated to continuing the Club’s tradition. Baptism on November 18, 2018 of Zaria Rose Croteau, daughter of Leila McKie Croteau and Scott Croteau, sister of Nylah. Phyllis Hamilton. Funeral January 16, 2018 at Knox Presbyterian church in Manotick. Helen Tweddle died March 24, 2018. Private funeral March 29, 2018 at Queenswood United Church. Public Memorial April 7, 2018 at Heritage Funeral Home. There were over three hundred people in attendance. This was catered by Queenswood United, and very well done. Helen was a real community builder and touched many lives in our suburb. Reverend Ray Purchase. Memorial Service June 20, 2018 at Queenswood United Church. Officiated by Rev. Brooke Belliveau. October 7, 2018, Sylvia Williams became a member of Queenswood United Church. There were no weddings at Queenswood United Church in 2018. The Ministry and Personnel (M&P) Committee had a relatively active year. We are pleased to report that we were able to develop and implement job descriptions and overtime policies for the 3/4 Time Minister and the Office Administrator (OA). The job description for the OA updates the previous statement of work used for staffing purposes. It reflects all tasks to be performed and was approved by Council effective January 2, 2018. As a result of the OA taking responsibility for the Envelope Secretary, Council approved the removal of the Job Description for the position of Envelope Secretary from the QUC Constitution â€“ Finance Committee. The work description for the 3/4 Time Minister is a new document for QUC and was approved by Council effective January 2, 2018. It is based on duties identified by the congregation during the JNAP exercise with the primary focus of the job to prepare and deliver weekly sermons, provide pastoral care, and complete administrative duties. Like any job description, this document will help Rev. Best manage her 30 hour work week as well as help the congregation better understand the limitations of 3/4 time ministry. To help staff to work within limited hours and not incur overtime, Overtime Policies were developed for the 3/4 Time Minister and the Office Administrator. The new Overtime Policies will help staff focus on core tasks and provide them with a process to follow when overtime is necessary. QUC stepped outside the box this past summer with Council’s approval of M&P’s proposal to allow Barb Bode, Office Administrator, to work off-site in Prince Edward Island from June 5, 2018 to September 28, 2018. During this time period, Barb used her annual leave entitlements, banked overtime, leave without pay, and committed to working a maximum of 4 hours a week through the internet. Thanks to Rev. Nancy who was in regular contact with Barb and to dedicated volunteers, Elayne Bonnell and Barb Johns, the remote working situation was a success. While the working arrangement was a success, Barb Bode decided that the island life was the life she wanted year round and submitted her resignation on September 29, 2018. Her last day of work was October 26, 2018. A selection committee to hire a new Office Administrator was established and Denise Benoit accepted the position effective October 23, 2018. Denise has proven to be a very skilled, capable and friendly employee who is well liked by our membership. Welcome Denise. I would like to thank M&P Committee Members, Marta Nuijten and Ray Bonnell for their expertise and support throughout the year. If anyone is interested in becoming a member of our Committee, please let us know. The only requirement for membership is that you are not part of an existing Committee. The Senior Choir remains the same in number and we really miss Barbara Bode who has moved to Prince Edward Island. We are 15 strong voices that keep the singing in our Church Services going. The Anthems that we sing each Sunday are well received and match each of the themes for each Sunday’s service. Our thanks to Michelle Godin who keeps us on track each Sunday. Our thanks to Pat Messier, Tom Sear and Katy Gratton who fill in for Lynne when she has commitments to follow on the weekend. Our Choirfest produced $1,200 to each of the Gloucester and Cumberland Christmas foodbanks in 2018. Our Celebration of Life will be the first Sunday in May 2019. The following report presents a slate of Officer nominations for the Queenswood United Church Council and Trustees for 2019. All representatives of the Council and the Trustees must be voted in by the Congregation at the Annual General Meeting. Positions of high priority that are still vacant at the time of writing are listed in bold type. Trustees: Frank Stacey (Chair), Don Morwick, Stan Blythe, Rose Marie MacLennan, and Rev. Nancy Best. Note: Rev. Nancy Best is also a Trustee by virtue of her position as our Minister. To participate in local and international outreach programs. Thanks once again to Don Morwick (our honorary member) for providing & printing the fridge magnets reminding the congregation of the items required and the dates of the appeals and for making the Christmas Challenge envelopes. In 2017 Outreach continued its support of the Orleans-Cumberland Resource Centre (CRC) by organizing food appeals throughout the year. Outreach stays in close contact with the CRC to organize donations for the most urgently requested items. This year, Outreach adopted a different approach at Thanksgiving collecting donations of $264.00 to purchase food cards. Two $25 Superstore cards were also donated. This method provided revenue for QUC and flexibility for the CRC to purchase urgent items. The fall appeal collected much needed toiletries items for distribution to clients at Centre 507 and The Well which enables them to maintain proper hygiene, improve self-respect and clean up before job interviews. A special spring appeal for full size toiletry items for the Montfort Les Terrasses Residence was held and was very successful. A spring a3ppeal was carried out to collect paper products (Sanitary napkins, Depends, Kleenex) a pressing need for the women at The Well. Our annual Christmas Mission Tree Appeal was enthusiastically supported again this year by QUC. Two trees were heavily decorated with donations of warm clothing (hats, toques, mitts, gloves, long underwear, socks etc.) to brighten the lives of those most in need. These donations of clothing for men, women and children were promptly delivered by Committee members to Centre 507 and The Well. The Christmas challenge, as in past years, was based on the philosophy of sharing a portion of one’s Christmas largesse with those most in need in our community. Response was wonderful and the QUC community contributed $1,115.00 dollars to make Christmas brighter for those who have so little. To assist with their breakfast program, a check for half the amount was sent to Centre 507 and a similar donation was made to The Well. Thank you for supporting our Bread for Bread program on communion Sundays. 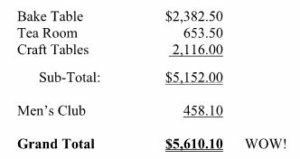 This year the program was again successful raising $599.57. All of your coins are used to provide soup and sandwiches to the hungry who come to Centre 507 seeking support. An additional emergency collection of $235.75 was raised for the Tornado victims in the Ottawa area and donated to the Red Cross. For the five Sundays in Lent, the QUC Congregation was asked to review the coloured insert included in the Feb 18 Worship Bulletin and to consider making a donation to assist women in the third world. The total donation of $356.00 was used to make loans via Kiva to assist women and children in the third world. In addition to supporting The Well through our various appeal programs, Outreach member Marti Scrivens volunteers weekly assisting with literacy activities and Pastoral Care. Donations of used clothing from QUC members are also delivered to The Well throughout the year. Since 2012, our participation in Kiva has been yet another example of QUCâ€™s commitment and generosity for supporting those in need. The Kiva initiative is managed very ably by Outreach member Lucie Deschamps who aims to make loans in different locations for a variety of small businesses that will best help vulnerable groups achieve self-sufficiency. In 2018, we supported 25 new loans, 9 of which were funded with donations for our 2018 Lenten project. Of these 25, 4 have been totally repaid and 5 others are now more than 50% repaid. Wereceived 10 full repayments on 2017 loans. On the 21st of August 2018, Kiva sent us a virtual birthday cake to mark our 6th anniversary. The Outreach Committee, coordinated a Sunday Service, entitled “Hear the Knock” to provide insight into the local organizations that Outreach supports. Presentations on Kiva as a special, detailed Minute for Mission are made during the year. Pastoral Care provides supportive care to members of Queenswood United Church. Due to circumstances beyond our control, this year has been especially challenging because we are working with a minimal number on our team who are able to be active participants. With this in mind, we have had to prioritize our commitments. We try our best to continue to help people who require attention due to illness, have suffered a loss or in general need attention. We do our best to continue making home visits, hospital visits, phone calls, mail cards and supply meals as necessary. All support is given in a confidential manner with utmost respect for the individual and/or family. The Pastoral Care team provides contact information in the CNN news. Please do not hesitate to call the members listed. This year from April 3 to May 1, our team assisted in the setup and provided snacks for a five week grief workshop. Elayne Bonnell from Queenswood United and Heather McGrath from Orleans United Church were the workshops coordinators. This workshop was held at Queenswood United with evening sessions. The topics included defining grief, finding the holy in grief, First Nations spiritual practices for dealing with grief, living with grief and speaking to children about loss and death. Each workshop was well attended and well received. The team continues to support the bazaar in November and the May Spring bazaar by making muffins and coffee for the workers. We also continued “the strawberry social” held in conjunction with the Sunday school picnic. We provided gift packages of shortbread cookies to all members participating in the December service. Our team includes the following members: Kathy Ritchie, Lynda Rodney, Sharon Boutin, Marti Scrivens, Gail Marcogliese and Heather Lait. One of the aspects of the Visioning process was to reach out and become more involved in our immediate community. Three years ago, our church contacted churches within the Orleans area to meet and discuss the duplication and sharing of programs with the emphasis on seniors’ needs. The following churches have remained as a constant at the quarterly meetings: Orleans United, Navan-Vars United, Queenswood United, Resurrection Lutheran, Community Pentecostal, Divine Infant, Grace Presbyterian and St. Helen’s Anglican. Periodically, we put out information to other churches to attract more participants. We have gone beyond sharing ideas and programs for seniors. The other churches make us all aware of the social problems occurring in our community. We have supported dinners for Montfort Renaissance residence and did a Thanksgiving dinner this past year. Our Queenswood Pastoral Care team continues to coordinate the meetings, keeping the contact lists current, arranging the agenda, communicating information to other churches and chairing the meetings. Our committee members are: Sharon Boutin, Kathie Ritchie, Marti Scrivens, Gail Marcogliese, Lynda Rodney and Heather Lait. 2018 was a year of transition and preparation for change at Presbytery. As such, the themes for the two parts of the year were: “Threshold” for January to June, and “Being Faithful to the Future” for September to December. The eight remits voted on by Presbyteries and faith communities across Canada during 2017 and early 2018 paved the way for profound changes in the United Church of Canada. For many presbyters it was a very difficult year, as they said good-bye to many familiar ways of being the church, and waited, with some apprehension, for news of how we will continue to be the church going forward. Carol Pugsley and Marilyn Joseph chose photos of QUC activities over the years for a montage to be shown at Montreal & Ottawa Conference’s last-ever AGM in May. The montage revealed QUC’s lively, informal character, and highlighted activities such as special services, community dinners, outreach activities, our singing choir, and many, many smiling faces. Rev. Nancy commented that our presentation did an excellent job of illustrating that the church IS the people. The most immediately significant work done at General Council involved the passing of seven of the eight UCC Remits, reflecting the will of the individual faith communities and Presbyteries who had voted earlier, and putting into play major changes to UCC structure and financing, among other things. Remit #6: One Order of Ministry, was not voted on at GC43 as it did not pass at the Presbytery/pastoral charge level. QUC’s voting results were the same as the outcomes at GC43. Also at GC43, Rev. Dr. Richard Bott was elected the new Moderator of UCC. He was born in Marathon, Ontario, and since being ordained in 1994, has served in both small and large congregations across the country, as well as in various capacities at the Presbytery and Conference level. He seems to be bringing a vigour and excitement about his beliefs and his Church to his new role as Moderator. Perhaps the strongest impression left on those who attended GC43 was presented by a very moving unscheduled session near the end of the proceedings, where racialized and indigenous commissioners and guests took to the microphones to talk about their experiences with racism and marginalization in the church. Those reporting back to Ottawa Presbyters on this session were both surprised and deeply moved, and, although they were unsure as to the significance of the event, felt without doubt that this was an example of the Spirit at work. When The United Church of Canada was formed, it required an Act of Parliament to become a legal entity. Thus The United Church of Canada (UCC) Act was passed by the Parliament of Canada in July 1924, and the Church was born on June 10, 1925. The UCC Act details literally everything which makes the United Church what it is (governance structure, doctrine, finances, definitions, administration, relationships, â€¦), and as such, must be amended to incorporate the changes proposed by the passing of the remits. According to the Parliament of Canada website, Bill S -1003 passed First Reading in the House of Commons on December 12, 2018, and, if it passes quickly through second and third readings, should become law by January 1, 2019. As of January 1, 2019, Ottawa Presbytery becomes defunct, and its Communities of Faith become members of Region 12, or EOOR. Our new regional colleagues come from the former Presbyteries of Upper Ottawa Valley, Seaway Valley, some faith communities in Four Rivers, L’Église St Marc (Ottawa), and, of course, Ottawa Presbytery. The Transition Commission, composed of members from all EOOR former Presbyteries, has been working diligently since spring to ensure that all necessary steps are taken for the smooth running of EOOR beginning on January 1, 2019, as have other courts in the new Three-Court church structure. Most staff have been hired and have been working since the fall. A region wide multi-day meeting for all regional representatives is planned for June 2019, and networks and methods of communication are being finalized. Friday September 21 saw an unprecedented weather event on our area when a major tornado caused devastation in neighbourhoods in Dunrobin, Arlington Woods, and one of the poorer sections of Gatineau. Presbytery kept us updated on the situation in each community, as reported by the local ministers. We saw church communities leading the way with such activities as going ahead with a planned funeral by candlelight, community meals, babysitting for families living in hotels, long-term support, and longer-term planning for the restoration of communities which will never be the same again. Rev. Debbie Roi of Dunrobin UC proposed to Presbytery/Region that local United Churches contribute to planting trees in affected areas next spring, which would be forward-looking, hopeful, and a way to help restore God’s creation and our communities. The continuing thoughtfulness and caring displayed are awe-inspiring! Our own Reverend Nancy was celebrated at the May Presbytery meeting for completing 5 years in ministry this year -Congratulations Nancy! comfortable present, as migratory creatures turn their backs on still summery weather to follow the compulsory call to head south for the winter. Our final Presbytery meeting ended with a full communion worship service, where candles of Gratitude (“Remembering our Past, with Gratitude”), Respect (“Honouring our Present, with Respect”), and Hope (“Dreaming our Future, with Hope”), were lit during the service, and, at the end, carried out of the Sanctuary, still lit. It was a very gentle and moving service, underlain with faith. QUC’s alternate Presbytery Representative is Reg Best. A number of repairs were done in the last year. We replaced the left side of the roof in May because the shingles were buckling and flying off the roof. In the summer, night lights were repaired. We secured several loose boards to the portable. The lock of the left hand side of the door was also repaired. Ongoing maintenance continues to be done. All windows of the church were washed in May. Furnace filters were changed in July and January. The floors of the Chapel were waxed and buffed in August. Emergency lights in the Chapel were checked monthly to ensure that they were working. Elayne Bonnell and I made sure that garbage got to the curb every week. A heater was purchased for Reverend Nancy’s office as it gets quite cold in the winter months. In 2018 the Property Development Group of Don Morwick, Stan Blythe, Marilyn Joseph, Steve Williams, Peter Visser, and Rose Marie MacLennan, continued to actively consult with Bob Richards of Edge, a Network for Ministry Development of the UCC, regarding our exploration of potential options for property development. The Group and Bob Richards had additional conversations regarding development options with partners from Windmill Developments, a developing firm who has worked, and is working with other churches, including Southminster United Church here in Ottawa. Valuable conversations were also held with staff of the Multi-faith Housing Initiative (MHI), which is a non-for profit charity that seeks additional opportunities for safe and affordable housing in the Ottawa area. MHI is committed to not only building infrastructure, but to actually providing staff, programs and other supports, to build communities from various economic levels, enabling greater understanding and appreciation of what all bring to community. also held in November 2018. By a Council decision on 22 January 2019, the Property Development Group became the Property Development Committee, with some voluntary changes in membership. Its overall mandate as specified by Council is to represent our Council and Congregation throughout the re-zoning and development process, working with key stakeholders, and ensuring that our Council and our Congregation are both informed and involved as necessary, throughout the process. Work in 2019 has already seen the hiring of a lawyer with a background in property development to review related Agreements on our behalf, and the hiring of a Property Appraiser to provide a current assessment of the value of the property at QUC. Consideration of the initial Agreement with Windmill Developments is now in process at the Committee level, at the time of writing. The Committee will also be exploring the possibility of utilizing potential Development Support services for Congregations now under development by the United Church of Canada. It has certainly been a blessing to have access to the ongoing property development expertise available from Edge, an innovative, internal resource of our very own United Church of Canada. What would Queenswood United Church do without the volunteers who come out each year to help with the Services and keep our Church running!! Be sure to thank these volunteers who do this work each week and throughout the year — they deserve so much more. The members of the Committee attending monthly meetings during 2018 were Rose Marie MacLennan (Co-Chair), Carol Pugsley (Co-Chair, and Secretary), Barb Johns, Michelle Godin as Choir Director, Lynne Stacey as Pianist, and Rev. Nancy Best. Elayne Bonnell was our Set-Up Coordinator, with her setup team comprising of Ray Bonnell, and Peter Visser. Their ongoing weekly efforts to ensure that our sacred space is well prepared for our worship services is truly a wonderful ministry amongst us that needs to be gratefully acknowledged. Bev Morwick continued her very efficient ministry as our Communion Coordinator, ensuring that both people and materials are present for the Sacrament of Communion. I extend my most heartfelt thanks to all named above, for their very active and ongoing support of the program of Christian Worship at QUC during 2018. Specially themed services or events were held throughout the year to mark the special seasons during the church year. These specially themed services included Advent, Christmas, Epiphany, and Easter services, as well as specific occasions such as Remembrance Sunday, Healing and Remembrance Sunday, Celebration Sunday, and Favourite Hymns Sunday. Special Worship or related events that were offered included the Sacred Self Series events with Pam Hodges and her Trio or Quartet, and the Special Worship Service led by Linnea Good in October. Additional response by the Worship Committee this year was especially required during the spring and summer of 2018 due to two factors, namely; the required absence of our Minister, so that she could receive the vacation leave to which she was entitled prior to the end of the pastoral year on 30 June, and the required extended absence of our pianist who very fortunately was able to rejoin us once again in August. During the above noted period of time, internal and external resource personnel volunteered or were hired respectively to lead Sunday worship services. For the 10 Sundays during that specific time period, our volunteers including Elayne Bonnell, Barb Johns, and myself led worship for six of those 10 Sunday Services, thus providing continuity in worship leadership by those known to our congregation, and also saving QUC at the very least $750.00 plus allowable mileage costs required for externally sourced worship leadership. In addition, members of the Worship Committee have led other worship services throughout the year, when our Minister is absent, or have provided the message or a related presentation, as part of a worship service. The Outreach Committee under the leadership of Barb Johns and Bev Morwick has taken responsibility for Worship Services as well, which is sincerely appreciated, noting also its alignment with our Vision and Mission. Two Licensed Lay Worship Leaders (LLWLs) known to our congregation were hired during the summer,for four Sunday worship services, at a total cost of $500.00. Also for the late spring and summer, two supply pianists were hired as required at a cost of $40 dollars per Sunday. Financial donations were received specifically for the provision of summer music supply which were very appreciated. Even with internal budget controls in place, the 2018 budget allocation of $2000 was exceeded to a small degree. It is important to note for future budget planning, that despite the past savings by our internal supply resource volunteers, and our minimal rates of pay for both LLWLs and supply pianists, that the usual music anthem purchases were curtailed this year, due to the need for budgetary restraint. The future intent is to seek opportunities to partner with other churches in sharing music anthems, in addition to being hopefully able to purchase some music for our own collection, if that is possible. Our ministry of worship, and its music (the latter led by our Senior Choir and its leadership), as well as our access to external pulpit and music supply resources of quality when necessary, embodies our spiritual experience together here at QUC. However, everyone needs to be aware at this time that our current rates of pay for some external resource supply personnel are not competitive with other churches. Also, frankly speaking, we can not take as a given our own internal volunteer resources as well. In summary, and in looking forward, those supply worship related expenses, for which the Worship Committee is responsible will require our active financial support going forward, to help maintain an important piece of our current level of spiritual experience.